This is the new Ioniq from Hyundai. Like the Toyota Prius, it’ll come in hybrid and plug-in hybrid guises, but there’ll also be a full-electric version. Hyundai is the only car maker to offer one car with a choice of hybrid, plug-in hybrid or pure electric power. We drove both the full electric and hybrid models on the roads around Liverpool, the Wirral and North Wales. We love the Electric Premium SE, with its heated seats; driver’s power seat with integrated memory system; blindspot detection; window defogger and front parking sensors. How far can I go on a charge? The hybrid/plug-in hybrid versions get a 1.6-litre petrol engine, but the former will only operate in pure-electric mode for brief periods. Hyundai claims that the plug-in, meanwhile, can waft about silently for up to 32 miles, at which point the fossil fuels kick in. Opt for the pure electric model and the e-range rises to over 156 miles. Use a fast charger and, says Hyundai, you can juice the lithium-ion battery to 80 per cent in 24 minutes. What about the infotainment features? Yeah, they’re OK. There’s Android Auto/ Apple CarPlay functionality, a seven-inch TFT instrument binnacle and, coolest of all, wireless smartphone charging. I’m guessing it’s fully autonomous? You’ll still need to actually drive the thing, but you do get help: autonomous emergency braking, lane-keep assist, lane-departure warning, blind-spot recognition and smart cruise control all feature on this clever motor. Sounds good. 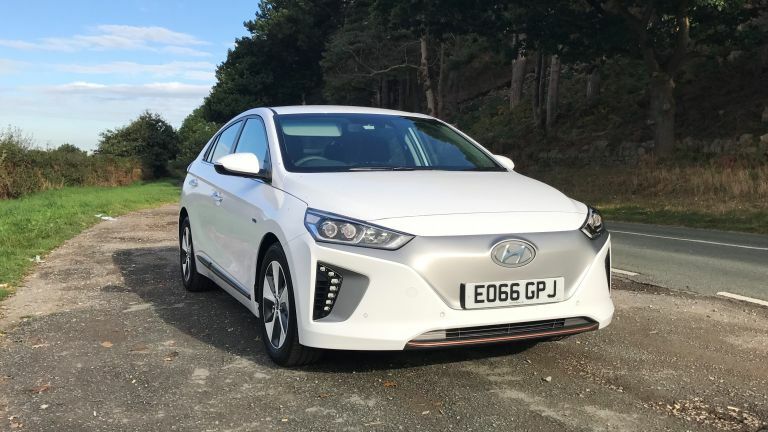 The Ioniq Hybrid SE 1.6 is £19,995 (with a Premium version costing from £30,795), while the Electric Premium SE is £28,995. The plug-in hybrid will be available later in 2017. Handsome and feature-packed, the Ioniq puts paid to the idea that EVs are boring That sleek, aerodynamic shape makes the car nippy when driving around town.